The investment firm co-owned by Russian billionaire Alisher Usmanov has confirmed it has no current intention of an Arsenal takeover for six months. His investment vehicle Red and White Holdings said Mr Usmanov would commit to this position for that period. Earlier in February Red and White revealed it had increased its stake in Arsenal football club to 24%. It says it has funds to increase its stake, but would not breach the 30% limit which would trigger a formal bid. Mr Usmanov would have to go ahead with a formal takeover offer if his stake exceeded that size. Red and White Holdings has previously been reported to have a goal of owning at least 25% of the company. 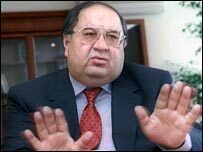 Mr Usmanov is a Russian metals magnate with an estimated $5.5bn fortune. He bought into Arsenal in August last year, paying former vice-chairman David Dein about £75m for his 14.65% holding. Mr Dein is now chairman of the consortium. Red and White's interest set-off a "lockdown" agreement by the Arsenal board, which meant the Uzbek-born metals magnate cannot launch a formal takeover bid at this moment. In a statement to financial markets his holding firm said: "Red and White is pleased to confirm its previous statement that it has no current intention to make an offer for Arsenal Holdings Plc ('Arsenal') and is committing to this position for a further six months. "Red and White has the necessary funding to increase its stake further. "However, it confirms that it will not acquire a shareholding in Arsenal which would trigger an obligation to make an offer for the shares in Arsenal. "As the largest shareholder in Arsenal, Red and White is delighted with the excellent results of the club on the field and would encourage all parties to focus on a trophy winning conclusion to the domestic and European campaigns." Earlier this month Arsenal said their half-year profits had risen 54%, boosted by the latest Premier League TV rights deal and the success of the new Emirates Stadium. The club, which tops the Premier League, made a pre-tax profit of £20m in the six months to the end of November, up from £12.6m in 2006. At the time Arsenal's managing director Keith Edelman said he was confident that an agreement between major shareholders would prevent a takeover by Mr Usmanov. "We were always advised by them that they would build their stake to 25% but we have a lockdown, which makes us bullet-proof," he said.